Financial leverage is the use of borrowed money (debt) to finance the purchase of assetsTypes of AssetsCommon types of assets include: current, non-current, physical, intangible, operating and non-operating. Correctly identifying and classifying the types of assets is critical to the survival of a company, specifically its solvency and risk. An asset is a resource controlled by a company which future economic benefit with the expectation that the income or capital gain from the new asset will exceed the cost of borrowingInterest RateAn interest rate refers to the amount charged by a lender to a borrower for any form of debt given, generally expressed as a percentage of the principal. The asset borrowed can be in the form of cash, large assets such as vehicle or building, or just consumer goods.. In most cases, the provider of the debt will put a limit on how much risk it is ready to take and indicate a limit on the extent of the leverage it will allow. In the case of asset-backed lending, the financial provider uses the assets as collateral until the borrower repays the loan. In the case of a cash flow loan, the general creditworthiness of the company is used to back the loan. This guide will outline how financial leverage works, how it’s measured, and the risks associated with using it. When purchasing assets, three options are available to the company for obtaining financing: using equity, debt, and leases. Apart from equity, the rest of the options incur fixed costs that are lower than the income that the company expects to earn from the asset. In this case, we assume that the company uses debt to finance the asset acquisition. Assume that Company X wants to acquire an asset that costs $100,000. The company can either use equity or debt financing. If the company opts for the first option, it will own 100% of the asset, and there will be no interest payments. If the asset appreciates in value by 30%, the asset’s value will increase to $130,000 and the company will earn a profit of $30,000. Similarly, if the asset depreciates by 30%, the asset will be valued at $70,000 and the company will incur a loss of $30,000. Alternatively, the company may go with the second option and finance the asset using 50% common stock and 50% debt. If the asset appreciates by 30%, the asset will be valued at $130,000. It means that if the company pays back the debt of $50,000, it will remain with $80,000, which translates into a profit of $30,000. Similarly, if the asset depreciates by 30%, the asset will be valued at $70,000. It means that after the paying the debt of $50,000, the company will remain with $20,000 which translates to a loss of $30,000 ($50,000 – $20,000). Total debt, in this case, refers to the company’s current liabilities (debts that the company intends to pay within one year or less) and long-term liabilities (debts with a maturity of more than one year). Equity refers to the shareholder’s equity (the amount that shareholders invested in the company) plus the amount of retained earnings (the amount that the company retained from its profits). Companies in the manufacturing sector typically report a higher debt to equity ratio than companies in the service industry, reflecting the higher amount of the former’s investment in machinery and other assets. Usually, the ratio exceeds the US average debt to equity ratio of 54.62%. 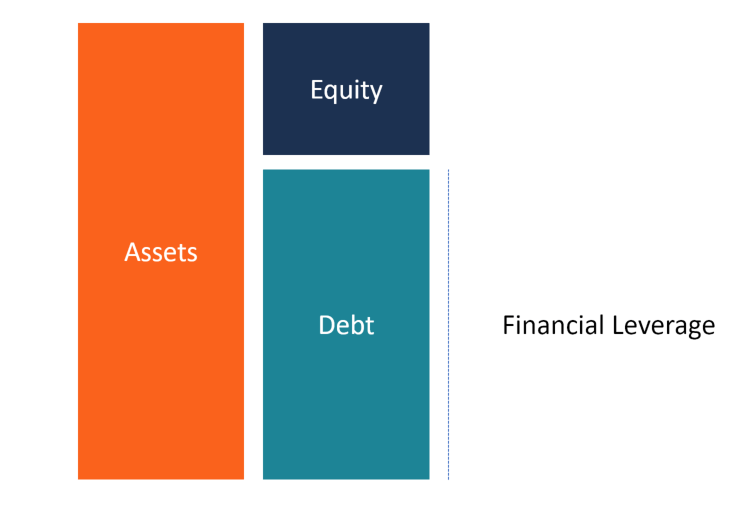 While the Debt to Equity ratio is the most commonly used leverage ratio, the above three ratios are also used frequently in corporate financeCorporate Finance OverviewCorporate Finance involves the financial aspect of businesses wherein sources of funds are determined, existing assets invested, excess profits distributed. Corporate finance also includes the tools and analysis utilized to prioritize and distribute financial resources. The ultimate purpose of corporate finance is to to measure a company’s leverage. Although financial leverage may result in enhanced earnings for a company, it is also likely to result in disproportionate losses. Losses may occur when the interest expense payments for the asset overwhelm the borrower because the returns from the asset are not sufficient. It may occur when the asset declines in value or interest rates rise to unmanageable levels. Increased amounts of financial leverage may result in large swings in company profits. As a result, the company’s stock price will rise and fall more frequently, and it will hinder the proper accounting of stock options owned by the company employees. Increased stock prices will mean that the company will pay higher interest to the shareholders. In a business where there are low barriers to entryBarriers to EntryBarriers to Entry are the obstacles or hindrances that make it difficult to enter a given market. These may include technology challenges, government, capital costs, switching costs, etc.A primary barrier to entry is the cost that constitutes an economic barrier to entry on its own. An ancillary barrier to entry refers, revenues and profits are more likely to fluctuate than in a business with high barriers to entry. The fluctuations in revenues may easily push a company into bankruptcy since it will be unable to meet its rising debt obligations and pay its operating expenses. With looming unpaid debts, creditors may file a case at the bankruptcy court to have the business assets auctioned in order to retrieve their owed debts. When lending out money to companies, financial providers assess the firm’s level of financial leverage. For companies with a high debt-to-equity ratio, lenders are less likely to advance additional funds since there is a higher risk of default. However, if the lenders agree to advance funds to a highly-leveraged firm, it will lend out at a higher interest rate that is sufficient to compensate for the higher risk of default. Operating leverage is defined as the ratio of fixed costs to variable costs incurred by a company in a specific period. If the fixed costs exceed the amount of variable costs, a company is considered to have high operating leverage. Such a firm is sensitive to changes in sales volume and the volatility may affect the firm’s EBIT and returns on invested capital. High operating leverage is common in capital-intensive firms such as manufacturing firms since they require a huge number of machines to manufacture their products. Regardless of whether the company makes sales or not, the company needs to pay fixed costs such as depreciation on equipment, overhead on manufacturing plants, and maintenance costs.